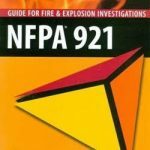 The NFPA 921 Guide for Fire and Explosion Investigations, a long-respected training and reference guide, is free to access online. The 2014 edition is the most current. The Organization of Scientific Area Committees (OSAC) for Forensic Science recently approved the guide for inclusion on the OSAC Registry, which serves as a trusted repository of high-quality, science-based standards and guidelines for forensic practice.